The pants are ours – De broek is van ons/De broek is de onze. What about direct object pronouns? Are they like the subject pronouns, the indirect object pronouns or a completely different form? There's a catch though. 'Jullie = je' only seems to work when 'jullie' is the subject. "Waar hebben jullie je spullen gelaten?" vs. "Waar hebben jullie jullie spullen gelaten?". It would not be okay in other ways. Wrong: "Waar zijn je spullen? Ik heb ze jullie net gegeven?". Also never ever write d'r in formal situations. To me it just looks way too colloquial. More so than if you would write the others, as they are more just shortered versions. With haar/d'r there is a total sound change (H vs. D). Often when you say z'n or d'r in speach you still write zijn or haar when transcribing, because it looks neater. Are jouw and jou pronounced the same? Is it van hen or van hun? In the tips and notes it says van hen but here it says van hun. Yes. My native Dutch friend has specifically said he uses "je" instead of "jou" most of the time to avoid confusion - though I would imagine context would also give enough clues for you to understand which word is meant. 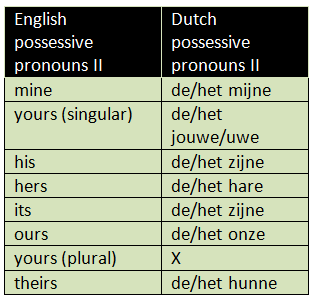 The Dutch possessive pronouns cannot refer to plurals, right? The object it refers to is always singular, unlike in English. Please correct me if that is wrong, but otherwise it might be worth adding to this page. Well, to answer the question 3 years later... Yes, they can. Just use 'zijn' instead of 'is'. Het is niet mijn boek, maar de jouwe. Het zijn niet mijn boeken, maar de jouwe. In the tree, when we start the lesson on possessives, we are given the form "van hen" for 3rd person plural in the tips & notes section. Should this be "van hun", as on this page? Also, for the 3rd person singular neuter gender, we see "ervan" and "hiervan" in the same tips & notes section, but on this page, we see "van hem". Lastly, in the same tips & notes section, we can read that "You use je to avoid saying jullie twice in a row. For example: I give you your books - Ik geef jullie jullie boeken - Ik geef jullie je boeken", but this information is not given here. We only see "jullie" as 2nd person possessive adjective. Is it more common to use -s to indicate possession, or to use the pronouns?